The United States said Sunday the time for talk over North Korea was “over,” spurning a UN response to Pyongyang’s latest ICBM launch in favour of bomber flights and missile defence system tests. Nikki Haley, the US envoy to the United Nations, said there was “no point” in holding a fruitless emergency Security Council session, warning that a weak additional council resolution would be “worse than nothing” in light of the North’s repeated violations. North Korean leader Kim Jong-Un boasted of his country’s ability to strike any target in the US after an intercontinental ballistic missile test Friday that weapons experts said could even bring New York into range — in a major challenge to Trump. US strategic bombers on Saturday flew over the Korean peninsula in a direct response to the launch, and on Sunday American forces successfully tested a missile interception system the US hopes will be installed on the Korean peninsula. Under Kim’s leadership, North Korea has accelerated its drive towards a credible nuclear strike capability, in defiance of international condemnation and multiple sets of UN sanctions. The US Senate passed new bipartisan sanctions on Pyongyang on Friday. “An additional Security Council resolution that does not significantly increase the international pressure on North Korea is of no value,” she wrote. “It sends the message to the North Korean dictator that the international community is unwilling to seriously challenge him. Earlier, US President Donald Trump warned that he would not allow China — the impoverished North’s sole major ally and economic lifeline — to “do nothing” about Pyongyang. In two tweets, Trump linked trade strains with the Asian giant — marked by a trade deficit of $309 billion last year — to policy on North Korea, after Seoul indicated it could speed up the deployment of a US missile defense system that has infuriated China. Trump has repeatedly urged China to rein in its recalcitrant neighbor, but Beijing insists dialogue is the only practical way forward. Shinzo Abe, the prime minister of US treaty ally Japan, also urged Beijing to act — along with Moscow — after telephone talks with Trump on Monday Tokyo time. The North had “trampled all over” efforts to seek a peaceful solution to the situation and “unilaterally escalated” tensions. “The international community including China and Russia must take it seriously and step up pressure,” he told reporters. Pyongyang lauded the developers of the missile at the weekend, the official Korean Central News Agency (KCNA) reported. The US-led campaign only provided “further justification” for the North’s resolve to maintain its weapons programs, Pyongyang’s foreign ministry said in a statement carried by KCNA. 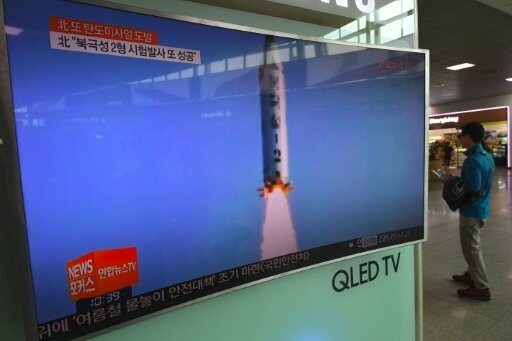 The ICBM test “is meant to send a stern warning to the US making senseless remarks, being lost to reason in the frantic sanctions and pressure campaign against the DPRK,” it said, using an acronym for the North’s official name. Independent experts say it brings Los Angeles and Chicago within range, and could travel as far as Boston and New York. “If called upon, we are ready to respond with rapid, lethal and overwhelming force at a time and place of our choosing,” he said. In a 10-hour joint mission at the weekend US B-1B bombers along with fighter jets from the South Korean and Japanese air forces practiced intercept and formation drills. It was followed by the successful test of the missile defense system, with the launch of a medium-range missile over the Pacific that was “detected, tracked and intercepted” in Alaska.